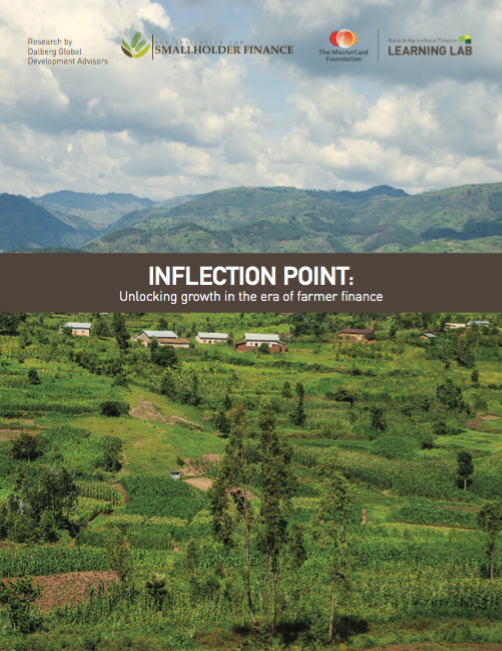 In partnership with the Initiative for Smallholder Finance, we at the Rural and Agricultural Finance Learning Lab are excited to announce the release of our new landmark study, Inflection Point: Unlocking growth in the era of farmer finance. Following decades of more singular approaches to providing smallholder farmers with financial services, the smallholder finance industry is now marked by a more diverse set of actors – financial service providers, funders, market and research platforms, and technical assistance providers – yielding new approaches to collaboration and greater access to information and technology than ever before. Our new study builds on Dalberg's 2012 Catalyzing smallholder agricultural finance. It provides a sophisticated picture of how the smallholder finance space currently operates by describing the key actors and the nature of their interactions, and conceptualizing these in a new "industry model." The study identifies market frictions across the major components of the “industry model” that continue to inhibit smallholder farmers’ access to financial services and opportunities for removing them, and rallies sector actors around the need for more collective action than ever before. Inflection Point suggests that while current activities to expand financial inclusion are not sufficient to meet smallholder demand, concerted efforts around customer centricity, progressive partnerships, and smart subsidy have the potential to change the sector’s growth trajectory to better serve the world’s smallholder farmers. The demand for smallholder financing is staggering. Over 270 million smallholder farmers in Latin America, sub-Saharan Africa, and South and Southeast Asia require over USD 200 billion in financing to grow their businesses and improve their livelihoods. Formal financial institutions (providing 14B) and value chain actors (providing 17B) meet less than a sixth of this need today (and only a quarter of the need when informal providers are included). Doubling projected annual growth (from roughly 7% to 14%) would allow these providers to meet more than half the need by 2025. To achieve this, Inflection Point presents a bold call to action for financial service providers and other actors to engage closely with customers to design and offer appropriate, desirable products through integrated partnerships, supported by more and smarter subsidy. The current era of farmer finance is at an inflection point, requiring new (and intentional) collaboration if we hope to serve millions of smallholder farmers and their families. We’re proud to be a part of these efforts at a transformative moment for the sector. In an increasingly engaged and dynamic community of practitioners, each of us have a role to play in expanding access to finance for smallholder households and we hope that you’ll join us.